Indian cooking has always been very aromatic – as long ago as the Mohenjo Daro. Blending a different combination of aromatic spices into every dish is an excellent way to create variety and enhance the flavor of the food – an aspect of cooking which has gained in importance as the quality and taste of food-stuffs have generally declined since Independence as a result of poor farming conditions/ low investments in agriculture. Unlike Mexican, or Thai, or Korean food, Indian upper and middle-class food has not been traditionally spicy-hot. While the poor of India have eaten spicy-hot dishes (using mainly cayenne pepper lal mirch) because other spices have been out of their reach: few farmers in India can afford the seven or eight spices, some of them pricey, which go into a middle-class Indian dish; or the time required to marinate/ roast/ cure /blend the spices prior to preparation of every meal. But the middle-and upper-class Indian homes were able to enjoy a variety of spices and retain a specialized servant — the spice-walla — to perform this laborious task three times a day. They were not spicy-hot dependent. Indian food began to grow spicy around 2005: the first appearances of prik chillies in some dishes prepared in private homes in Delhi was welcome by several of my foodie friends as a creative nouveau cuisine touch. I do not believe my friends realized those instances were a harbinger of a larger trend and I wonder if they would have praised them as liberally then if they knew what was to come. I believe the use of prik chillies in Indian cooking can be traced to the discovery of Thailand as an accessible/ fashionable tourist destination for the Indian middle class. 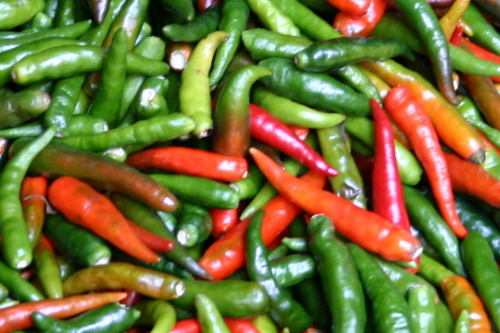 Indians returning from Thailand would adopt aspects of Thai interior design, clothing and – prik chillies. Adding a handful of prik chillies to a home-made curry was a Delhite’s way of feeling cosmopolitan, fashionable, with it. It also helped to mask any minor short-comings of the cuisine: while two or three shavings of a prik chilli can introduce an interesting note to a dish normally had milder, a more plentiful use of prik chillis obscures other flavors, making it possible for not so great cooks to mask their shortcomings. By march 2011 prik chillies have invaded all North Indian cousine, including such traditional kashmiri stalwarts as Chor Bizarre in Old Delhi, whose palate as recently as 2005 was delightfully (and authentically) mild, creamy, fruity, and sweet. (In short – Kashmiri). An extensive, semi-professional sampling of New Delhi restaurants conducted by yours truly (a bit of a masala-whiz himself, if he says so himself) in March 2011 has failed to turn up a single North Indian restaurant which did not engage in massive over-use of prik chillies; which in itself would be bad enough, making, as it was, the entire meal (which normally consists of 3 or more different dishes) harsher, flatter, more single-dimensional and – frankly, boring, than it would have been in olden days. Alas, in nearly all instances, the prikification of the food also went hand in hand with general lowering of standards: less use of other spices, more frequent use of poorer quality spice, and very frequent incorrect use of spices (insufficient roasting / marinating/ curing/ blending). Use of whole cardamom-nut, for instance – formerly common in the better sort of establishments – has by now practically disappeared from New Delhi repertoire. Luckily, in March 2011, Delhi’s South Indian food still offered a refuge form mass prikification; and, after some time, bitterly disappointed by the prik-adulterated Northern fare, yours truly switched to an entirely-Southern diet. Yet, South India is not immune to trends, merely slower to adopt them: by November 2011 five of the eight dishes served as part of the set Thali at the Sagar Ratna restaurant in Ashok Hotel (formerly the proud flagship of southern cooking in the North) were rather harshly prik-spiked, preventing some diners like myself from enjoying the traditional bitterness of Tamil food. Ten years ago a spicy-hot Ghassem was unheard of. Indeed, it seems such a thing would have brought out Tam-Brams, barechested and be-stringed, protesting violently in the streets. As of last week, that other Southern redoubt in the North,Saravana Bhavan (Janpath) still served a properly, authentically Tamil Tamil Thali, but observers like myself feared that it was only a matter of time before it, too, would lower its standards and go for prik.